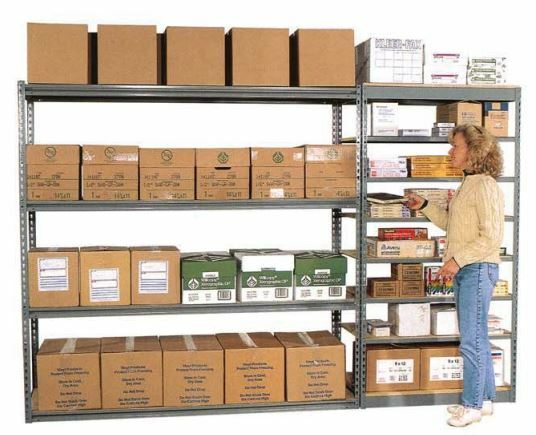 Blog Home > Industrial Shelving > How Much Money does Shipping Rivet Shelves Without Decks Save? You can see that easily enough when you compare a 48″ wide, 36″ deep shelving unit with decks included to one without. The unit with particle board decking weighs 206 pounds and change. When you remove the decking, the shelving weighs just 75 pounds. This is why we offer the shelving both ways. The shipping cost for ten units of this shelving with 5/8″ inch particle board would be a around double the cost of shelf framing only, depending on the way it’s shipped and where it’s going. Since we provide online shipping calculation, you can check our site to see exactly how much you’d be saving. Also, smaller orders can typically be shipped via UPS or other package delivery services if they don’t include wood decks. We properly package, band and protect our shipments, but particle board can get chipped, dented or broken in shipping a lot easier than the steel frames can. So if you want to save that shipping cost, the easy thing to do is to acquire the particle board from any local lumberyard. You’ll have to have it delivered or go pick it up, but it will be less than shipping it motor freight. It’s an easy cut to make since the shelf size listed actually indicates the deck size. A 48″ x 36″ shelving unit requires 48″ x 36″ decks — no tricky measurements or cuts. Our Rivet Shelving Estimator provides estimates, component lists, but it’s great for projects and rudimentary layout assistance.